Donna Sharp gives us a purse that's green in color only with the Jenna. 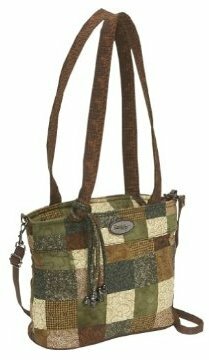 This shoulder bag has a neutral toned gingham pattern that the designer calls Earth Patch. It seems to suggest that there's something especially eco-friendly about this shoulder bag, but that's not the case. Instead it's made from the same fabrics Donna Sharp uses throughout her line, simply sponged to create an earth-toned check finish. My biggest problem is that in this world of eco-conscious individuals, the name Earth Patch seems a bit misleading. It appears determined to get the green dollar where it doesn't really deserve it. Yes Donna Sharp uses fabric and shies away from leather, but we're not told of the material's green credentials. We don't know whether the fiber is organic or sustainable, but some bagistas may spend up assuming that it is. The misleading name aside, this bag is just what we'd expect from Donna Sharp. It's generously sized and well appointed, comfortable to carry with its long, plush handles and impossible to fault on a practical front. It's just not very fashion forward, but for $47 we shouldn't really expect high end designer looks. The Donna Sharp Megan Earth Patch bag, a great alternative to this Earth Patch bag.